The fleet of Mobile Galleries 1965. 1962 – 1970. The Mobile Art Galleries . It was only a minority of, generally, wealthy people, who were buying art in Britain in the early sixties. Galleries were invariably forbidding places with the precious atmosphere of churches. Modern art was often obscure, pretentious, having little to do with the lives of the general public. Artists often said “The Public do not understand me” and the public said they did not know anything about art, but they knew what they liked. Going from door to door, taking down to earth Art to the People in his Mobile Galleries, Nick attempted to bring the artists and their potentially buying public together. 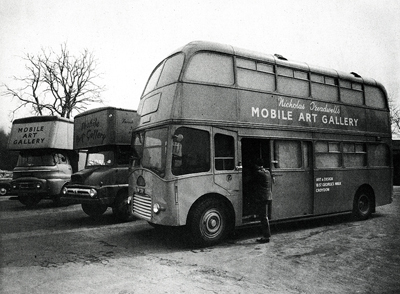 Starting out in 1963 with one gallery in the back of an old furniture removal truck, by 1965, Nicholas Treadwell was running three Mobile galleries, including a double decker bus. As Nick Treadwell slowly established his seminal Chiltern Street gallery in the late sixties, the Mobile Galleries, having helped him build up a substantial mailing list of new art buyers, were phased out. 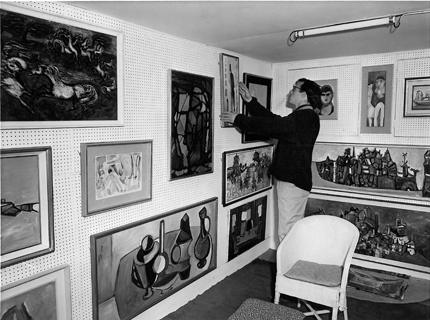 Interior first Mobile Gallery 1963, with works by Sadanand Bakre, Tony Underhill, Endre Boszin and Jack Yates.